In addition to our proprietary WF-WRF model, we have access to all of the major U.S. governmental weather models (including GFS, NAM, ETA, and WRF) and model output from selected international forecasting agencies. Our systems can also ingest MM5 or any other proprietary model data provided by a partner or customer, as long as the data is provided an industry standard format. 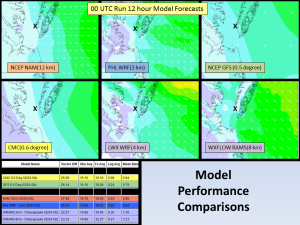 All of this data can be accessed and displayed by DataScope and other WeatherFlow applications, facilitating easy and rapid comparisons between models and to observed conditions. Plans for the near future include expanding our in house modeling capabilities to include the Weather Research and Forecasting (WRF) model, which is in wide usage in government, university, industry, and research applications. 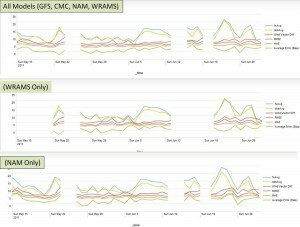 WeatherFlow is also active in several initiatives to apply ensemble techniques to various forecasting regimes and problems, including WF-WRF, and other components.